Get inspired for your next trip, party, or home re-design by these celebs who’ve found a unique way to incorporate glamping into their busy lives. From girls’ weekends and wedding style to romantic getaways and children’s play areas, celebrities like Kourtney Kardashian and Solange Knowles have found creative ways to get involved in the hottest way to vacation: luxury camping. Shay Mitchell, star of “Pretty Little Liars” and lifestyle blogger at “Amore & Vita,” went glamping California-style with girlfriends in November of last year. Cozied up in a lofted cabin near Santa Barbara, Mitchell and company took advantage of their proximity to nature by strolling on the beach, horseback riding, and making hot dogs and s’mores over the campfire. We couldn’t have done it better ourselves—combining all the best of camping, but upgrading from a basic tent and outhouses to plush beds and deluxe bathrooms. Both Kourtney Kardashian, TV personality, designer, and mother of three, and Miley Cyrus, singer, songwriter, and actress, have incorporated glamping style into their homes and personal lives. Kardashian’s interior design scheme includes tipis in multiple rooms that add a stylish, yet kid-friendly, element to any space. Cyrus, on the other hand, opted to add a 22-foot tipi to her backyard, said to be a 21st birthday present from family members. 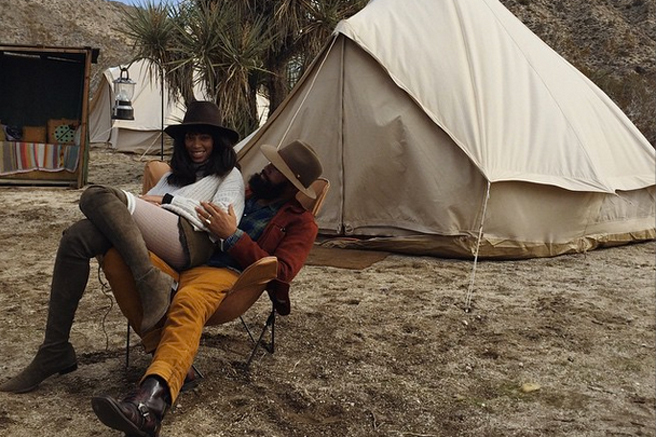 This won’t be the last you hear of celebrity glamping this year, either. At the Oscars in late February, the runners-up in the Best Actor/Actress, Supporting Actor/Actress, and Director categories all received swag bags filled with six figures-worth of goodies, including a $12,500, seven-day glamping trip. We’re imagining snapshots of Bradley Cooper discovering the woodlands around an upscale yurt and Emma Stone relaxing on the balcony of a tree house with a great new vacation read. Here’s to hoping the Instagram gods hear our pleas.